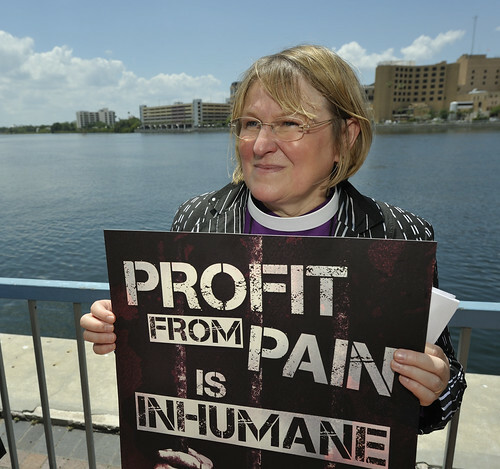 Bishop Rosemarie Wenner of Germany stands with a sign at a rally against private prisons during the 2012 United Methodist General Conference in Tampa, Fla. The rally was sponsored by United Methodist Women and the United Methodist Task Force on Immigration. A UMNS photo by Paul Jeffrey. Click on image to enlarge.View more photos. 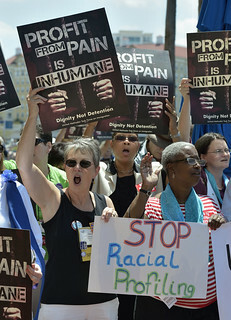 Chanting "dignity not detention," singing songs of justice and holding posters and banners, more than 500 endured the noon heat in Tampa to protest the growing private prison industry that especially targets immigrants and people of color. Bishop Minerva Carcaño of the Phoenix Area and Bishop Julius Trimble of the Iowa Area, co-chairs of the United Methodist Immigration Task Force, led the rally. Speakers included a Florida immigration advocate as well, as church members from around the United States, the Philippines and Germany. "This is a justice rally," Carcaño said. "Being out of immigration status is not a crime; it is a civil offense." Trimble called detention the new "Jim Crow." "Detention is just another word for being put in prison and stuck there," he said to cheers from the crowd. On an average day, the costs of keeping someone in a private prison are $122 per bed or $1.7 million a year, according to Detention Watch Network, an advocacy group. Something is wrong with a state that spends more to detain and imprison a person than to educate that person, Trimble said. Desmond Meade, a member of the Florida Immigration Coalition and the Florida Rights Restoration Coalition, spoke about his personal passion for incarcerated people. "It was six years ago. I was standing on a railroad track on a hot August day thinking of jumping in front of a train," he said. He had just been released from prison, was homeless and addicted to alcohol, and he felt he had no place to go, no dignity, no hope. "By the grace of God, I am a second-year law student, and I'm here to say nothing is impossible with God on your side." In advocating for immigrants, Meade said he found the private prison industry, under the guise of "get tough on crime laws, protecting our borders, zero tolerance, no child left behind" has actually been pushing policies detrimental to communities. The United Methodist Task Force on Immigration links the criminalization of "out of status" immigrants with the mass incarceration of people of color in the United States, Carcaño said. Sixty percent of the 2.3 million people now jailed in the United States are members of racial or ethnic minority groups, with one of out every eight black males in their 20s incarcerated on any given day. Trimble said private prisons promise states big profits if the states can promise 90 percent occupancy for 20 years. But there is good news for United Methodists, he added. In 2011, the United Methodist Board of Pension and Health Benefits prohibited investments in companies deriving revenue from private prisons, selling $1 million in stock divested from private prison corporations. The board added private prisons as the sixth screen guided by the denomination's Social Principles. The Rev. Audrey Warren, pastor of Branches United Methodist Church in Florida City, Fla., and a member of the task force's Rapid Response Team, told the story of four immigrant members of her community who were stopped and harassed by authorities. One was detained and deported six months later to Nicaragua. "The immigrant is not a stranger," she said. "The immigrant is not the other. The immigrant is United Methodist." Migrants, "the most vulnerable people in the world," face the double victimization of performing "dirty, difficult and dangerous" jobs and being blamed by others "for their sorry situation," said the Rev. Connie Mella, Mindanao Philippines Annual Conference. United Methodist Women from around the world participate in a rally against private prisons during the 2012 United Methodist General Conference in Tampa, Fla. A UMNS photo by Paul Jeffrey. Click on image to enlarge.View more photos. In the Philippines, for example, an estimated 3,500 people leave the country every day in search of work, but at least six return home every day in coffins, she said. "If the world is our parish, these people are our parishioners," Mella declared. "Because they are human beings, we need to uphold their human rights." Bishop Rosemarie Wenner, who leads the Germany Area, talked about policies against migrants in Europe and the battle in her own country to stop the construction of a detention center within a new airport being built in Berlin. Delyn Celec, on staff at Shenandoah University in Winchester, Va., said being at the rally was important to her. "We need to be aware of all God's children and what we can do to create an equal church and country with equitable laws," she said. Sean McRoberts, from the Iowa Annual (regional) Conference, said the rally was "a call to come together and be more aware of what our government is doing - supposedly on our behalf." At the rally's conclusion, Carcaño announced that the Council of Bishops has agreed to send letters opposing prison privatization to all 50 U.S. states and Puerto Rico. *Gilbert is a multimedia reporter for the young adult content team at United Methodist Communications, Nashville, Tenn. Bloom is a United Methodist News Service multimedia reporter based in New York. Follow her at http://twitter.com/umcscribe. Amanda Bachus, director of Spanish resources, United Methodist Communications, and Elliot Wright, former communications staff with the United Methodist Board of Global Ministries, contributed to this report. News media contact: Tim Tanton, Tampa, Fla., (813) 574-4837, through May 4; after May 4, Nashville, Tenn., (615) 742-5470, newsdesk@umcom.org.